This simple treat is one to serve at any celebration or to turn any given moment into a celebration. Cut the recipe in half if you do not plan to consume the cashews within the week. That’s hard to imagine! Besides making these tasty cashews available on a tray along with other party finger foods, you can enjoy these cashews in lunch boxes, on coffee breaks, and as trail mix. You might also try sprinkling the cashew bits over a green salad dressed with vinaigrette, over roasted sweet potatoes or inside a wrap with salmon salad. 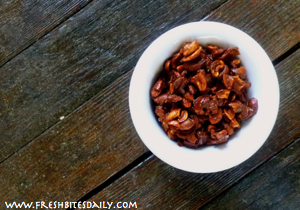 Feel free to use whole cashews in this recipe. I use the pieces because they tend to be cheaper and there is more surface for the savory-sweet coating. This recipe will fill a large baking sheet. You could oil the baking sheet before adding your nut mixture but I recommend using baking parchment instead. This way you are guaranteed the nuts will not stick which saves so much time. Once the nut mixture has cooled, store it in a tightly covered container. The coated nuts tend to absorb moisture from the air and get sticky. In this house we just lick our fingers if they get sticky, but I know not everyone is so casual about it. Place a medium sized skillet over a low flame. Add all the ingredients except the cashews. Turn off the heat and add the cashews. Toss the nuts until they are evenly coated. Pour the nuts onto a large baking sheet lined with baking parchment paper. Bake in a 300 degree oven for about 30 minutes. Use the top rack position for your pan. About 15 minutes into the baking, rotate the pan around so what was baking in the back is now in the front. Watch the color of this mixture closely. If any part of it begins to darken, pull it out of the oven to prevent burning. This is especially important in the last ten minutes. Set the finished nut mixture to the side to cool. It will harden as it cools. When the coated nuts are completely cool, break them apart to the degree desired. Some cashew pieces will remain in small clumps. Here’s a fun idea. Wrap little bundles of these nuts in plastic and tie with ribbons. Take them to work for your associates to enjoy at their coffee breaks. Or, take these little bundles when you go on a long day of shopping with friends. Pull out the nuts as a snack when everyone has their energy sagging. 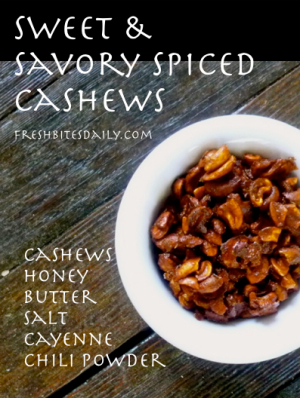 2 Comments on "Sweet & Savory Spiced Cashews"
This looks really good and decadent. I would like to try this for my birthday. Do you know the calorie count on the recipe? This food excites me. I don’t know how this sweet and spice cashews.